There are many challenges in maintaining an effective regulatory compliance capability. These begin with identifying the regulations and their related obligations that apply to your business but that is only the starting point. The next step is defining and establishing the appropriate management actions and controls to meet those obligations but this also is not the end. Keeping up with constant changes in regulations and obligations is essential, but so is understanding the impact of business operational changes, new technologies, and effectiveness of established controls — and then acting quickly to make necessary changes to stay on top of compliance. The volume and velocity of changes demands a new approach. By using cognitive capabilities now available in modern compliance technology, your compliance program can use fewer resources and provide greater insight than manual methods of management. Your system can help to define your needs, identify controls that must be adjusted to respond to changes, and continually learn what works and what doesn’t. 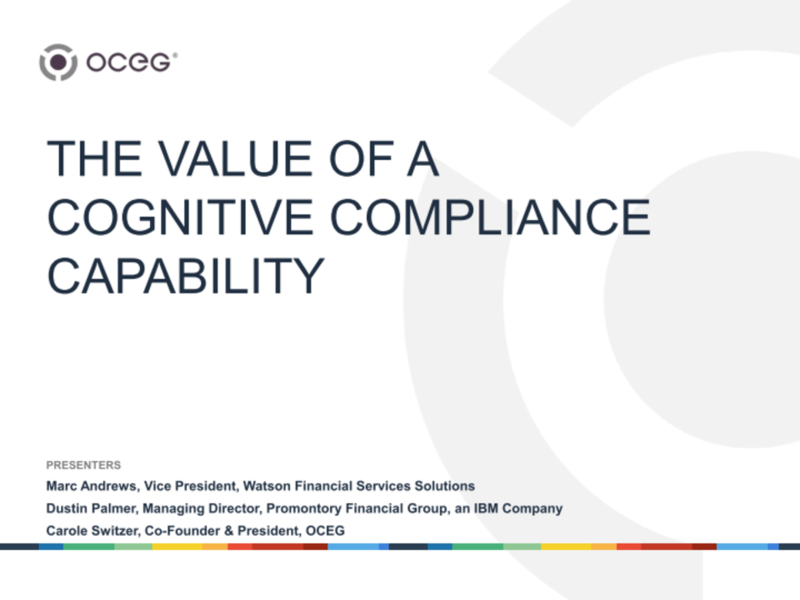 In this webinar, we take a look at the many ways a cognitive compliance capability can be an essential part of your compliance team. We have emailed instructions to access The Value of a Cognitive Compliance Capability Slide Deck to . Make sure the email arrives in your inbox: either add "support@oceg.org" as a safe sender to your email platform, or if you use Gmail, drag our email into your Primary tab.